Research shows that 80% of all normal births include some damage to the upper neck of the baby. This is why it’s vital to have children checked as soon as possible to avoid problems that often come up later in life, including learning disabilities, allergies and ADHD. Babies that are adjusted regularly also avoid distressing issues such as feeding problems, colic, ear infections and seizures. Why Do You Treat So Many Children? 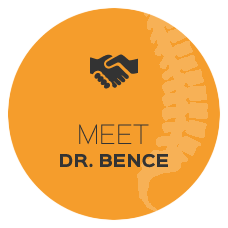 Dr. Bence is a family man with eight children of his own. He’s made it his mission to educate everyone he meets on the importance of chiropractic care beginning at birth. Every one of his kids has had their spine checked and adjusted from the day they were born, and his love and concern for them spills over into all the little ones in his practice family. We make it easy to be a kid in our office. We’re welcoming and patient, and provide a special place for children to play and be themselves. The quality of our care is unmatched, and the positive outcomes we attain are rewarding to not only the child, but the parents as well. More and more children today are being diagnosed with ADHD, and parents are being forced to rely on drugs to help their children fit into social and learning environments. Dr. Bence holds certification in the treatment of ADHD, and has had many successful outcomes with this epidemic issue. One of our practice members was an 8-year old little boy, referred by his medical doctor. When the child first came to see us, he sat in a chair with his head down, unmoving. He was unable to concentrate or listen to instructions, and completely unable to function in school. After only a few adjustments, his mom noticed that he seemed to be calmer and started to do his homework. Before long, our ADHD protocols began to really make a difference in this child’s life, and he was able to completely re-integrate into his school and community environment. Children respond quickly and efficiently to our gentle adjustment protocols. If your child is suffering from any physical or emotional issues, we may be able to help. Why not give chiropractic a try? Contact us today and ask about our new patient special!